“WHAT? GO SLOWER? How can that be possible? If I’m not going hard all the time, how can I get faster?” I’m not saying that high intensity training does not have its place in a well-developed, endurance training program, but how a focus on easy, aerobic training translates into speed/power is down to simple physiology and how physical adaptations occur. I’ll explain. There are a few reasons I can think of that contribute to the resistance from amateur athletes of placing a premium on easy paced, aerobic workouts, but the biggest is the misnomer that if you are not “working hard” you are not doing any good towards improving fitness. Perhaps this belief emanates from the notion of “No Pain. No Gain” that I have heard from sports coaches and fitness & strength instructors for decades. It simply is not true. The human body does not respond well to improving endurance with a singular, high intensity approach. Even when an athlete believes they are going easy, they are likely not going easy enough to effectively train one of the most important aspects of endurance…fat metabolism. No one would argue that a Half/Full Ironman triathlon or ultra-marathon are aerobic events. But, it might be a surprise to many that a sprint triathlon or even a stand-alone 5k run are aerobic in nature. In fact, any effort that lasts longer than 3-4 minutes is mainly derived from the aerobic energy system. The longer the event, the greater the reliance on the body to produce energy from aerobic metabolism, and a highly developed aerobic system relies heavily on fat combustion to fuel efforts. So how does going easy translate into speed or sustainable power? First, we need to understand what is happening on a cellular level when we exercise, and I’ll refer to cycling from this point forward, but the same concepts apply to other endurance-based sports. As intensity (power output) increase so does total energy demand. Some of this energy is derived from the utilization of fat stores and some from carbohydrates (blood glucose or glycogen stores). However, there is a peak in fat combustion well below Functional Threshold Power (FTP or Maximal Steady-State, which is the intensity at which a cyclist can hold for approximately 45-60 minutes), typically ranging anywhere from 55 to above 70% of FTP. At power outputs above this fat combustion peak the utilization of fat stores begins to drop very quickly and hits ZERO at FTP. Therefore, at Functional Threshold Power, 100% of the energy production comes from the combustion of carbohydrate. Why is this important to know? Because carbohydrate supply is limited. Let’s look at an imaginary Age-Group triathlete with the following performance characteristics. We’ll assume that the athlete has an FTP of 245 Watts with a known FATmax power of 165 Watts, where the maximal fat combustion is 388 calories per hour. It is also known that at this power the total energy demand for this athlete is 624 kcal/h, leaving 236 kcal having to be supplied via carbohydrate stores (388 via FAT + 236 via CHO = 624 tot kcal/h). The graph below shows these figures with the FATmax at the peak of the Green curve with FTP occurring at the termination point of this line as it hits the x-axis. 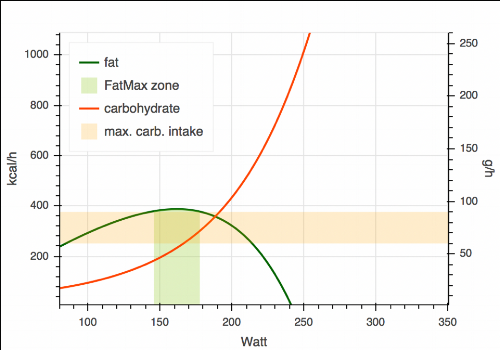 That Green curve (ignore the Red curve and Orange shaded area) represents total fat combustion in kcal/h at power outputs from 50 Watts to 245 Watts (FTP for this athlete) where fat metabolism runs to zero. The Green shaded area is the FATmax training Zone, where the greatest adaptations in the utilization fat stores occur. For this amateur athlete, a maximal fat combustion of 388 kcal/h is decent. But many recreational athlete’s FATmax is far lower. It is not uncommon for some to combust fewer than 190 kcal/h from fat, forcing the body to rely more heavily on carbohydrate to fuel their efforts. Why does training harder minimize the effects of improving fat metabolism? Because consistently training at higher intensities adapts the body to more efficiently utilize carbohydrate, not fat. The zone that most athletes try to target, because it feels moderately-hard to hard, is in a “grey area” below FTP, yet well above FATmax. In the graph above this would roughly be between 210 and 230 Watts. Don’t get me wrong, there are physiological adaptations that occur at this intensity, but improvements in fat combustion is not one of them. Training in this “grey area” will result in fitness gains, especially in unfit athletes, but the gains will be limited and eventually the athlete’s fitness will begin to plateau. Developing a sound training program, that places a premium on easier paced, aerobic workouts is critical to athletes seeking to improve endurance for any triathlon, cycling event or distance running race. The timing of higher intensity sessions is dependent upon the particular athlete, their current fitness status and goal races in the future. Improving the aerobic energy system should be the primary goal for any endurance athlete, especially those that are just starting out in a sport. The greater the athlete’s ability to burn fat as fuel, the higher sustainable power outputs will be in relation to Functional Threshold Power, their actual FTP will increase, the limited supplies of carbohydrate will be spared and the the less carbohydrate will need to be ingested to sustain a particular aerobic effort. What is possible in regards to fat combustion? Let’s look at the extreme, which people love to do. A world class, professional cyclist might have an FTP of 425+ Watts with a FATmax power of over 300 Watts and have the ability to combust in excess of 750 kcal/h FROM FAT at that 300+ Watt output! Their ability to utilize fat as fuel so effectively is what separates these athletes from even a top level amateur. Don’t discount the benefits of training easy. It could very well be exactly what’s holding you back from achieving your goals.